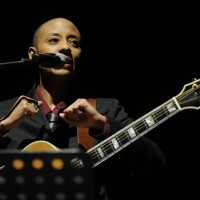 GAIL ANN DORSEY is an independent singer-songwriter and multi-instrumentalist who divides her career between writing, recording, and performing her own unique spin of classic pop, and touring as a bass player and vocalist for many other well-known artists. Gail has appeared on recordings and shared stages around the world, displaying her musical diversity and expertise with such musical icons as Tears For Fears, The Gang Of Four, Dar Williams, Catie Curtis, Ani DiFranco, Issa (formerly Jane Siberry), Sophie B Hawkins, Joan Osborne, Zucherro, The Indigo Girls, and Seal. She played bass for No Doubt front woman Gwen Stefani on both her 2005 and 2007 solo tours, but is probably most known for her long-standing position as bassist with the legendary David Bowie. Dorsey hails from Philadelphia, PA, a musically gifted youngster who taught herself to play guitar, bass, and drums before the age of 13, and by age 14 was playing in Top 40 bands as a bassist and drummer. During her teenage years in the mid-70’s, Gail began writing her own songs and eventually formed a band of her own band. Her early musical influences came from AM radio giants like The Carpenters, Olivia Newton-John, Bread, The Fifth Dimension, Helen Reddy, Paul Williams, Roberta Flack, Burt Bacharach, and even The Partridge Family! She was also drawn to the musical sophistication of artists such as Steely Dan, Joni Mitchell, Joan Armatrading, Heart, Neil Young, Queen, and Bowie. Gail based herself in London, England from the early 80’s through the mid-90’s, where she signed her first record deal at the age of 25. Her first solo recording for a major record label, ‘The Corporate World’ was released on WEA Records in Europe and the UK in 1988 to great critical acclaim. This was followed by a second major label release for Island Records in 1992 called ‘Rude Blue’. After the release of ‘Rude Blue’, Gail gave herself a break from center stage and focused her attention once again on her role as a session musician, becoming one of the most sought after and well-respected female bass players in the music world today. She eventually found time to release her third solo recording in 2003. ‘I Used To Be…’, marked the beginning of Dorsey’s foray into independent record producing and distribution. After the release of ‘I Used To Be…’, Gail began to perform solo for the first time in almost a decade, and now tries to keep herself active in the singer-songwriter arena as much as possible in between touring with other artists. She has opened for Ani DiFranco in the US and Europe, and graced the stages at Michigan Womyn’s Festival in 2004, 2005, and 2006. Armed with just her passionate and commanding vocal ability, her acoustic guitar, and an obvious grasp on the rich melodic tradition of classic pop songwriting, she evokes the some of the best qualities of many of her 70’s musical heroes and heroines, but with her own eccentric flare. 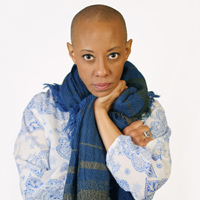 Gail Ann Dorsey shares memories of her decades as bassist for the late great David Bowie in this interview with Rolling Stone. 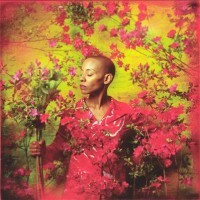 Tune in to America’s Got Talent on Wednesday, The Today Show on Monday, or The Late Show with David Letterman next Tuesday to see Gail Ann Dorsey performing in the Lenny Kravitz band. She’ll be touring with Lenny across Europe in support of his new album Strut coming September 23.